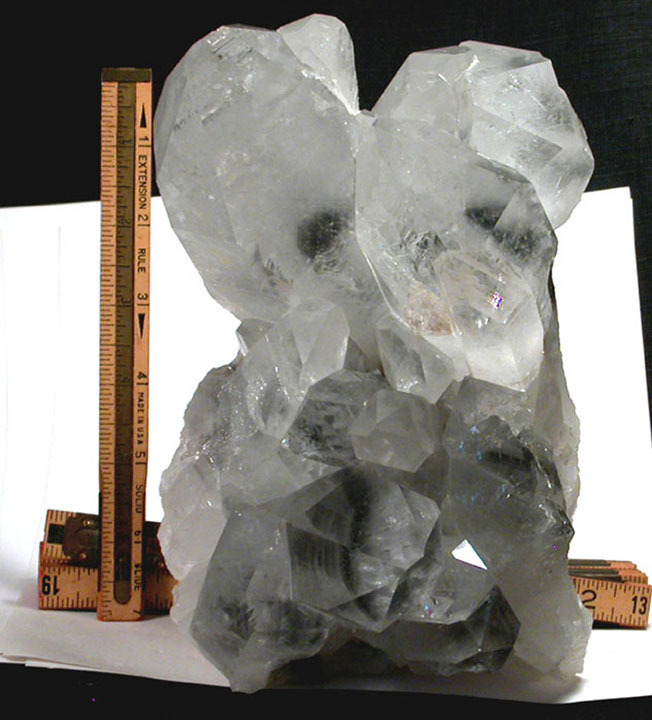 This Arkansas quartz large blue phantom floater cluster, 7x 5x 5" high, has goodly large points to 3x 6" high with rare irises, record keepers, rainbows, foils and veils. Dark blue [manganese] phantoms as single and layered in most of the crystals. The multi-directional crystals themselves include twin, penetrated, tiny diamond window and tabular. One conchoidal, one chip, one fleabite only - great condition! Notched extra faces to main faces and areas of regrowth give great, shining texture. Base is a regrown plate bottom with more record keepers, tiny rainbows, and a 2x 2-1/2" drusy sandstone patch. Substantial. Fisher Mountain, Montgomery County.